In 1869, Frederick Annesley Stapleton-Bretherton married the Hon. Isabella Mary Petre, daughter of the 12th Baron Petre. Together, they had 13 children. 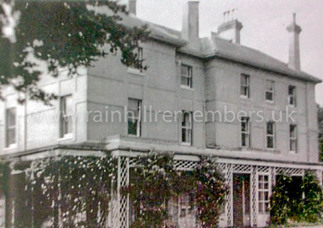 ‘The Hall’ in Rainhill was the family seat although the family also had a home called Heathfield House in Fareham, Hampshire. Frederick Annesley was appointed to several public offices. He was Deputy Lieutenant for Lancashire and served as a J.P. for Hampshire and for Lancashire. 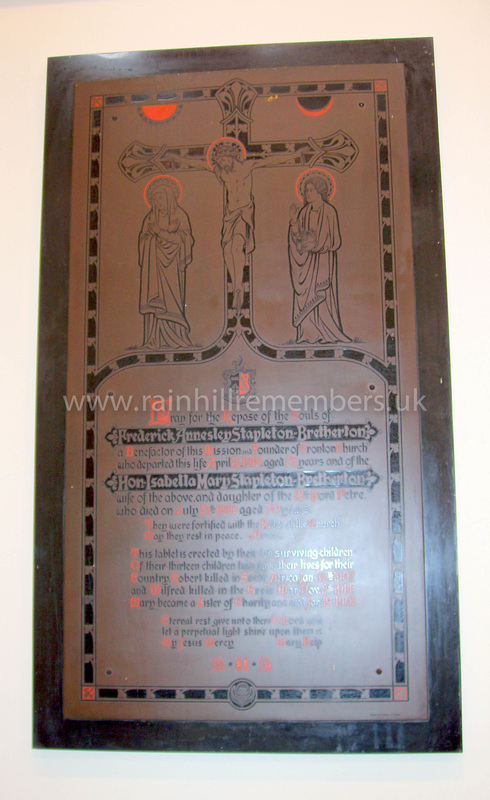 He and his wife were devout Roman Catholics and they financed the building of the Church of the Holy Family in Cronton as well as a church at Fareham. After the outbreak of war in 1914, most of the children of Frederick and Isabella were directly affected by the hostilities. The events of World War One brought much anxiety and sadness to the family. This was made worse for Frederick Annesley and his wife Isabella by adverse comments which were made about their daughter Evelyn who had married a German Count, Gebhard von Blucher, in 1907. Frederick Annesley did not live long after the end of the War. 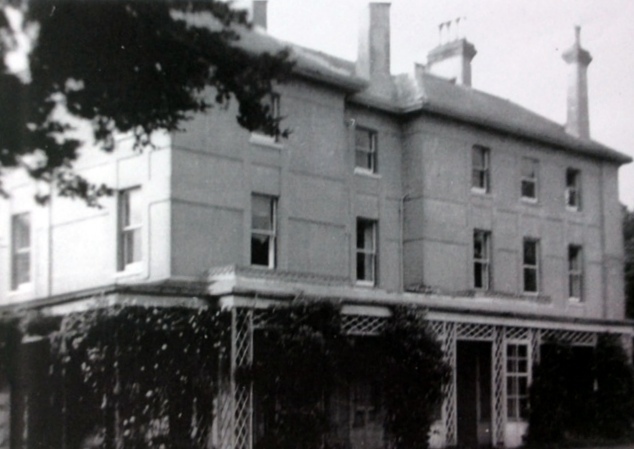 He died at Heathfield House, Fareham on April 13th 1919, aged 78. His wife, the Hon. Isabella died three months later in July 1919. When reporting on Frederick Annesley Stapleton-Bretherton’s death, the Liverpool Daily Post stated that during the War “some of Mr. Bretherton’s sons fought for and some fought against this country.” The three surviving sons (Frederick, Vincent and Edmund Stapleton-Bretherton) brought a legal action against the newspaper. Counsel for the plaintiffs stated that Mr. Bretherton had five sons, one of whom had been killed in the South African Wars, another was missing, believed to be killed in November 1914, and the three others had served in the British army. It was true that one sister some years before the War married a German officer – Prince Blucher – but the husbands of four other sisters had served in the British Army or Navy. “When the discovery of the mistake was made the defendants published a proper apology”. The court case was settled in Liverpool on 5th July 1919 - Damages and costs were awarded, the former were apportioned between charitable institutions. ​Despite having such a large family, the First World War was to bring losses to Frederick and Isabella to the extent that they were left with no direct male heir. 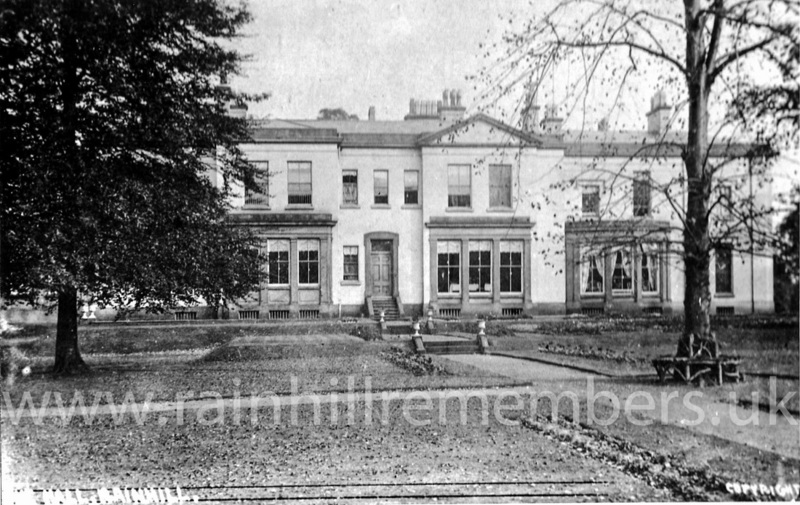 By 1920 the members of the family had left Rainhill and were mainly living in the south of England. It was decided to sell most of the Rainhill Estate. The Hall was sold in 1923 to the Jesuits who renamed it Loyola Hall. The Stapleton-Bretherton family still regarded Rainhill as their ancestral home and many members of the family are buried in St Bartholomew’s graveyard.